Our theme is designed to be simple to use, intuitive and powerful, and most importantly business orientated. 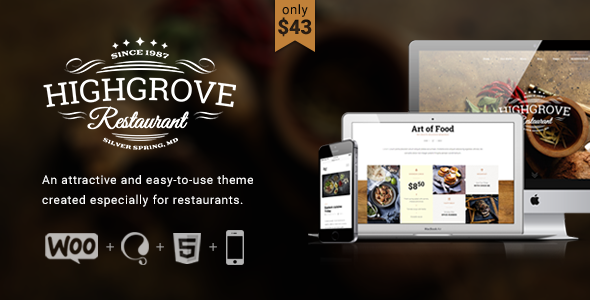 Packed with everything you need to launch your restaurant site in 5 easy steps! Attractive board of events, modern looking menus, customizable table reservation, and all-purpose Revolution Slider are just a few of many features and plugins bundled in – all within a single integrated interface. Simply perfect for you restaurant, bakery, coffee shop or winery! *Images and videos are just for demo purposes and are not included in theme files. Online documentation provides instructions for installation, help on getting started and extensive list of features. If you need technical support or have any questions, please send us a message via support form and we’ll get back to you as soon as possible. Want us to set the theme for you? If you don’t time or you don’t know how, we can install the theme for you and import demo content of your choice (restaurant, bakery, winery or coffee shop). For only $50 we’ll do all the leg work for you and you can take it from there.